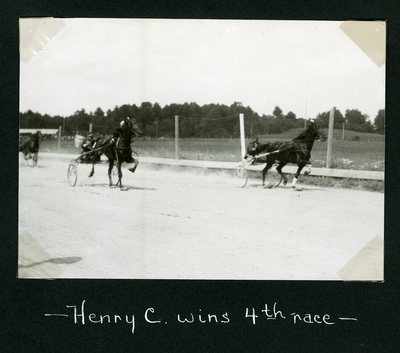 Black and white action photograph of black gelding Henry C. along the rail, owner /driver Frank Church Jr. up to win the sescond heat of the 2.16 Bar Trot in a time of 2.13 1/4. The race was part of the Gorham Fair Association races on Saturday, July 6 at Narragansett Park on the Gorham Fair Grounds, Gorham, Maine. Wearing head number eight, on the outside, Glorious Dawn finished the heat in second place.